Pterosaurs are not dinosaurs but are diverse and awesome. Quetzalcoatlus pterosaurs foraging on a Cretaceous fern prairie. One just caught a juvenile titanosaur. Courtesy of Mark Witton and Darren Naish from “A Reappraisal of Azhdarchid Pterosaur Functional Morphology and Paleoecology.” PLoS ONE 3(5): e2271. At the Carnegie Museum of Natural History in Pittsburgh, there’s no way to miss the Tyrannosaurs. The museum’s curators have constructed a scene in which two colossal theropods square off over a kill—mouths agape, teeth like sickles threatening to disembowel whichever fossil flinches first. You can almost feel the ground shake as the stone giants circle the carcass. But what of the sky? We tend to forget that while T. rex, Triceratops, Diplodocus, and the like were lumbering across the land, the air above was thick with volant reptiles. If you look up, you’ll see that the bones of Quetzalcoatlus, a pterosaur the size of a freakin’ fighter jet. “You’d be surprised how many people don’t even know it’s there,” says Matt Lamanna, a paleontologist at the CMNH. Of course, if humans had lived during the time of the pterosaurs, I think we’d have learned to look up. But Quetzalcoatlus and its monstrous kin are just one branch of the pterosaur family tree. We tend to think of pterosaurs as all being big, flappy sky reptiles, but these animals were every bit as diverse as the dinosaurs they shared the world with. And most of us don’t know a lick about them. For starters, did you know that pterosaurs were not, in fact, dinosaurs? Another way to explain this confusion is that some dinosaurs gave rise to modern birds, which can look a bit like pterosaurs. But there are no living descendants of the pterosaurs. In fact, pterodactyls are simply one kind of pterosaur. So referring to all pterosaurs as though they were pterodactyls is a bit like calling every species of cat a leopard. “If you can think of an ecological niche or job that a bird does today, there’s a good chance that we know of a pterosaur that probably did the same thing,” says Lamanna. The Azhdarchids, which include Quetzalcoatlus, are thought to have been giant plains predators, capable of killing prey with their spearlike beaks and then swallowing it whole. They probably also muscled in on carcasses that some other predator had already brought down. This opportunistic lifestyle is similar to that of modern-day storks and hornbills. But, you know, storks and hornbills from hell. Some smaller pterosaurs acted like modern-day oystercatchers that stabbed or hammered their prey. And toothy-grinned Dsungaripterus used its massive molars to chomp right through clams, crabs, and whatever other shelled creatures it could fit in its maw. In what is now South America, scientists have found a filter-feeding pterosaur named Pterodaustro that seems to have filled the role that flamingoes do today. These animals used their curved beaks and hundreds of bristle-like teeth to strain the ancient waters for plankton, algae, and small crustaceans. 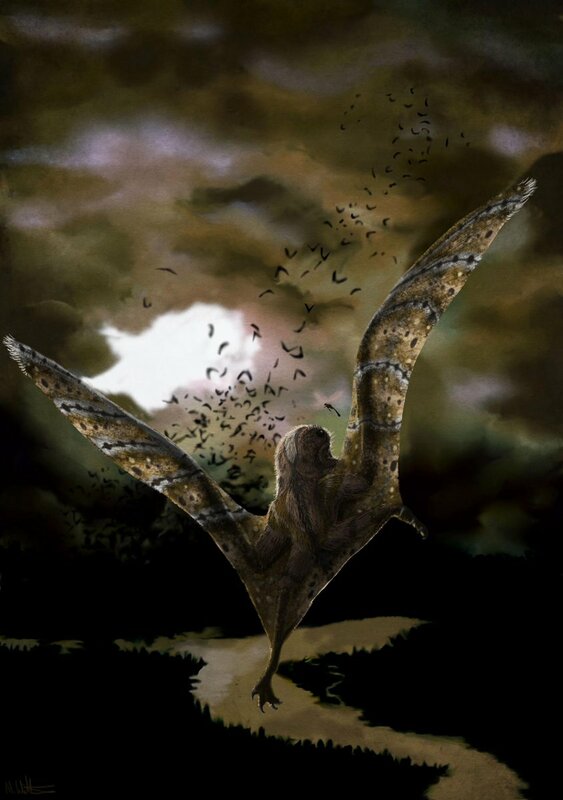 Personally, I love the Anurognathids because they don’t conform to what we tend to think of when we imagine pterosaurs. They don’t have the long beaks, head crests, or tails of pterosaurs in movies and cartoons. In fact, to see some artist renderings, it looks like nature took the head of a snake, mixed in the teeth of a piranha, and slapped it on a bat. Other species may have looked like sugar gliders, swallowtail moths, or creatures out of a Tim Burton film. Like birds, pterosaurs tended to have fragile bones—an adaptation for lightness and flight, but one that makes fossilization a precarious process. Lamanna says because of this we’ve probably only just scratched the surface on the variety of pterosaurs that once existed. These are the kinds of questions asked by an exhibit called “Pterosaurs: Flight in the Age of Dinosaurs” now making its way across the country. The pterosaurs land in Pittsburgh on Jan. 30, 2016, and I can’t wait. One thing, at least, is clear. Pterosaurs were incredibly diverse creatures, far more so than our plastic toys and CGI-laden movies give them credit for. Just imagine a small flock of these guys squabbling over bread crumbs at the park or zipping after mosquitoes above your backyard barbeque. Or more chilling—imagine the shadow of Quetzalcoatlus engulfing your SUV as you motor across Route 66. Let’s hope you remembered to fill the gas tank in Amarillo. *Correction, Jan. 4, 2016: This post originally misstated that animals in both the Pteranodon and Rhamphorhynchus genera as long-tailed. Only Rhamphorhynchus had long tails.